Sony lost a staggering amount of money last year. TOKYO – Sony Corp. reported a 98.9 billion yen ($1 billion) loss for the fiscal year ended March, its first annual net loss in 14 years, and projected it would lose even more money this year amid a serious slump in the global electronics market. Sony also said Thursday it is closing three plants in Japan to help turn its business around. Hit by dropping sales and the strong yen, Sony lost 165 billion yen in the January-March quarter, compared to a 29 billion yen profit for the same period the previous year. The Japanese electronics and entertainment company said no quick recovery was in sight, projecting a 120 billion yen ($1.2 billion) loss for the fiscal year through March 2010. The results are a reversal from the 369.4 billion yen profit Sony recorded a year earlier. Sales for the fiscal year through March slid 12.9 percent to 7.73 trillion yen, it said. Sony, which makes Bravia flat-panel TVs and Cyber-shot digital cameras, joins a string of other big Japanese corporate names, including Toyota Motor Corp. and Hitachi Ltd., that are announcing huge losses. Sony is closing three plants in Japan by the end of December — one for cell-phone cameras, another for video recorder parts and another for systems used for smart cards. After they are shuttered, the number of Sony's global plants will dwindle from 57 last year to 49. By operations, Sony said it had an operating loss in its core electronics segment because of the slowing global economy, price competition and a strong yen, which erased any benefits from better liquid-crystal display TVs. Sony also continued to lose money in its game segment, where its PlayStation 3 home console and PlayStation Portable have struggled against rival offerings from Nintendo Co., the Wii and DS, as well as in some markets against the Xbox 360 from Microsoft Corp. The company sold 10.06 million PlayStation 3 machines for the fiscal year through March, up 10 percent from the previous year. It also sold more PlayStation Portable machines, at 14.11 million during the fiscal year, up slightly from 13.81 million. 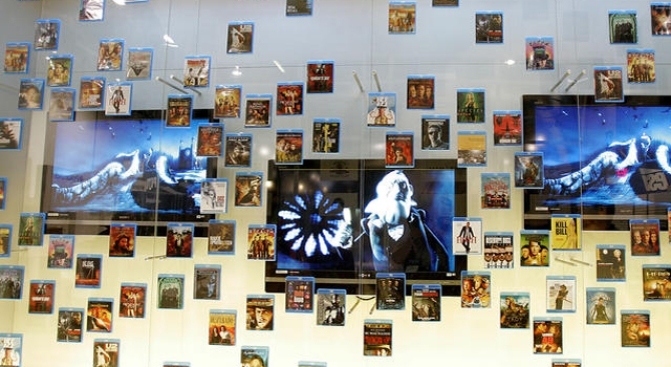 In its movies division, home entertainment sales declined, and were not offset by some of its stronger motion picture releases, including "Hancock," Sony said. Sales for the fiscal year fell in all key markets: down 20 percent in the U.S., 17 percent in Europe and 14 percent in Japan. Sony said its dismal forecast reflects its expectations that "deterioration in the business environment brought on by the slowing global economy will continue." Expenses related to restructuring efforts will also add to the losses, it said. Analysts say Sony's Chief Executive Howard Stringer, who decided to center power in his position earlier this year, has yet to give details of a turnaround plan, including strategies and products. Stringer has promoted four relatively young executives into his managerial team, representing Sony's gaming and electronics sectors. Sony also faces a host of rivals that make similar products, often at cheaper prices, such as Samsung Electronics Co. of South Korea, as well as manufacturers from Taiwan, China and other nations, such as Acer Inc. and Lenovo Group Inc.
Sony said Thursday it was on track with its previously announced plan to reduce 8,000 of its 185,000 jobs around the world, and trim another 8,000 temporary workers who aren't included in the global work force tally.